Lee Spear Burridge was born in Paris, France, on 22 September, 1861, the son of Dr. Levi Spear Burridge, a noted American dentist, and Emma Frances (Ogden) Burridge. Levi Spear Burridge (see the nearby portrait), was born on 15 July, 1829, in Painesville, Ohio, United States, youngest of the eight children of Samuel Burridge and Hannah Burridge (born Parmly). Levi was a nephew of (and was named after) Dr. Levi Spear Parmly (1790-1859), an influential American apostle of dental hygiene, and grandson of John Burridge (1756-1815), who came from England in 1770s, settled at Braintree, Massachusetts, and took part in the American Revolutionary War. Levi graduated from high school in his home town and later from the Madison Seminary. He studied dentistry at the Baltimore College of Dental Surgery and graduated in 1850 as D.D.S. (Doctor of Dental Surgery). Then in 1851 he received a M.D. at the Baltimore College of Physicians and Surgeons. After two years of practicing in New York with his uncle Dr. Eleazar Parmly (1797-1874, see the nearby image), also a dentist, Levi traveled to Rome, Italy, where he established his headquarters for 17 years. 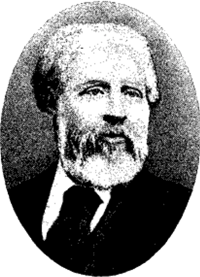 In Rome, in 1854 he met and next (1855) year he married Emma Frances Ogden (born on 15 February, 1821, in Bordeaux, France), a daughter of Samuel Gouverneur Ogden (1779-1860), a wealthy American merchant. 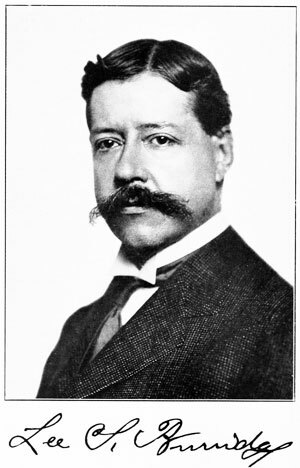 They had a daughter (who died early) and two sons, Francis (Frank) Ogden (born in Rome, 5 February, 1858—died 25 September, 1930) and Lee Spear. Levi practiced mainly in Italy, Austria and France (he settled in Paris in 1870), and his patients were Rothschild family, Pope Pius IX, the King and Queen of Naples, the Emperor and Empress of Austria. In 1879, Levi settled down and since then has been commuting between Europe and the USA. He died as a result of an accident on 28 November, 1887, in Cannes, France, and was interred in Woodlawn Cemetery, New York. Lee Spear Burridge was educated at Tunbridge Wells, England and in 1878 he moved to New York, entering the importing house of Aufmordt & Co. Being of an inventive turn of mind (in 1883 the American Institute granted him award of merit), he directed his attention to the manufacture of mechanical toys and in 1890 established the Sun Manufacturing Co. to exploit these novelties. Among his toys were a walking man and a creeping doll, which were marvels of ingenuity. Lee Burridge directed much of his efforts at simplifying the parts and movements of the typewriter, a technological novelty in those days. Some of his innovations over the years were: a new inking system combining a small self-supplying ink roll with a type-bar; a counter-balance type bar, permitting a very slight and delicate touch to the keys; a visible machine; a special type-bar machine operating 78 characters with only 10 keys (however, this odd machine was never produced. In 1882 Burridge began a long-lasting partnership with another inventor—Newman Marshman. They combined to work on a toy and jointly patented it (US patent 296724) in 1883. 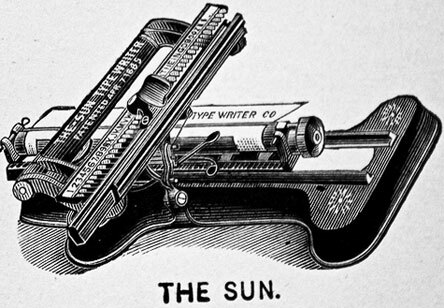 In 1884 they devised the Sun Index typewriter. In 1885 it was patented (patent US315386) and went into production (see the lower image). In 1887 Lee and his brother Frank incorporated the Sun Typewriter Co. in New York. Lee was president of this company until his death. The Sun Index was very successful and the sizeable profits it made allowed Burridge and Marshman to be kept almost fully occupied for the next 12 years. During this time, Burridge and Marshman produced and tested 685 prototypes as they tried to perfect a typebar typewriter. In early 1890s Burridge and Marshman devised and patented two adding machines (see the adding machines of Burridge and Marshman) and a cash register. In 1896 Marshman and Burridge offered a swinging type shuttle typewriter to the American Typewriter Co., but it failed. Soon after this failure they went their separate ways. Lee Burridge is well known to typewriter industry because of the machine he and Frank launched in 1901, the Sun No 2. This remarkable machine (see the lower image) was an early luggable, came in its own case, and was advertised as the only standard typewriter suitable for travellers. It is a small desk machine with an idiosyncratic inking mechanism, that sold quite well from 1901 to 1907. 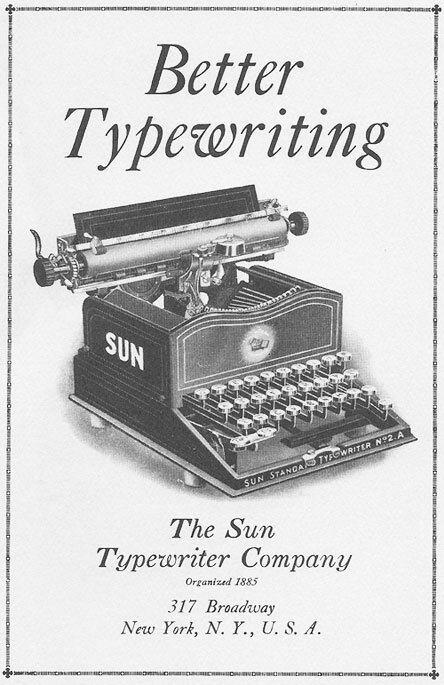 Sun keyboard machines were fairly successful and quite a few were made, and they were made up until the early 1920's. Lee Burridge never married, but did manage to leave behind at least three small Suns, the index model and the two keyboard models. Moreover, after his death, in 1919, Underwood Co. bought the patents for Burridge's machine and launched it in November 1919 as the Underwood Standard portable Typewriter. In 1908 Burridge became interested in aviation and together with some like-minded enthusiasts purchased the first aeroplane ever sold. He arranged the first public exhibition of flying that was given by Curtiss at Bronx Park. This aeroplane was sent on an exhibition tour throughout the United States and Canada, solely to foster and create public interest in aviation, and was in a large measure the start of practical aviation in USA. Lee Burridge founded the Aeronautical Society of America and was the president for several years. He was also a member of the Aeronautical Engineers Society, the Automobile Club of America, the National Geographic Society, and the Aero Club. Lee Spear Burridge died at age 54 at his home on 160 West 54th Street in New York, on 4 May, 1915. At the time of his passing his estate was appraised at $91,000. Unmarried, Lee left this small fortune, and his unassigned typewriter patents, to his brother Frank.